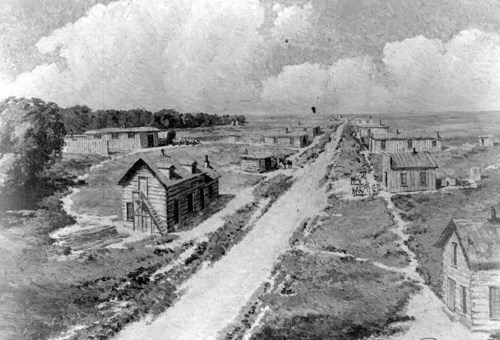 A black and white photograph of "Wichita in 1869" painted by Wichita artist Coy Avon (C. A.) Seward in 1920. On September 28, 1920, The Wichita Beacon noted that the painting was "presented to the [Sedgwick County] Pioneer Society by business men in the city" and "shows Wichita as a trading post along a trail (Waco avenue) extending north from the Munger house." On May 1, 1921, The Wichita Eagle reported that the painting was painted "from description and data furnished by William Finn, the city's first surveyor. Mr. Finn declares this picture to be a very true likeness of the city as it appeared to him when he arrived in the late summer of '69." The Pioneer Society later donated the painting to the Wichita-Sedgwick County Historical Museum.